Just one day after Jill Stein officially filed for a recount in Wisconsin, an effort which the Hillary Clinton campaign now says it will take part in, a second state is also bracing itself for an impending recount of its own. The Director of Elections in Michigan says that his state is now also preparing for a recount, under the expectation that Stein will file there once she’s legally allowed to on Monday. Clinton is also on board for the effort in Michigan. 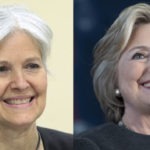 Jill Stein was able to raise several million dollars in a period of just a few days in order to cover the filing costs for recounts in the states of Wisconsin, Michigan, and Pennsylvania, along with what are expected to be massive attorneys fees in each. After she officially filed in Wisconsin on Friday, the Hillary Clinton campaign announced that it would also participate. The Clinton campaign stated that it would also participate in the Michigan and Pennsylvania recounts if and when Stein officially files. Now that Stein has raised around six million dollars, she has enough funding move forward with all three recounts, even as she seeks one million more dollars to cover inevitable legal fees. Accordingly, Michigan’s Director of Elections Chris Thomas is telling the Detroit Free Press that “Our plans are being drafted” for the impending recount. That means the Wisconsin and Michigan recounts should end up taking place close to simultaneously, with Pennsylvania forthcoming.